The NEW Assault design creates a significantly stiffer tower for significantly less vertical flex! Unique to the Assault tower is its integrated rack design. 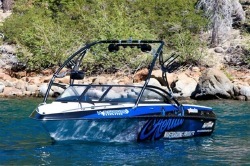 This model features 2 racks: You can choose Wakeboard Racks or Kneeboard racks. The Assault tower also accommodates all existing Aerial speakers, lightbars, speakers/lightbar combo bars and mirrors. Aerial Wakeboarding Towers are an excellent choice for the ultimate water ride because they look good and are priced right.